There are two places everyone should visit regularly to get modern life in perspective. One is a museum, the other’s a dump. Especially an old dump. There’s something haunting about this profligate scattering of old paste jars, fragments of pottery with words like award-winning, warmest and proven treatment; something resolute yet pathetic about that old tin bucket with its handle still up, or that chunk of iron machinery with the cogs fixed by rust. 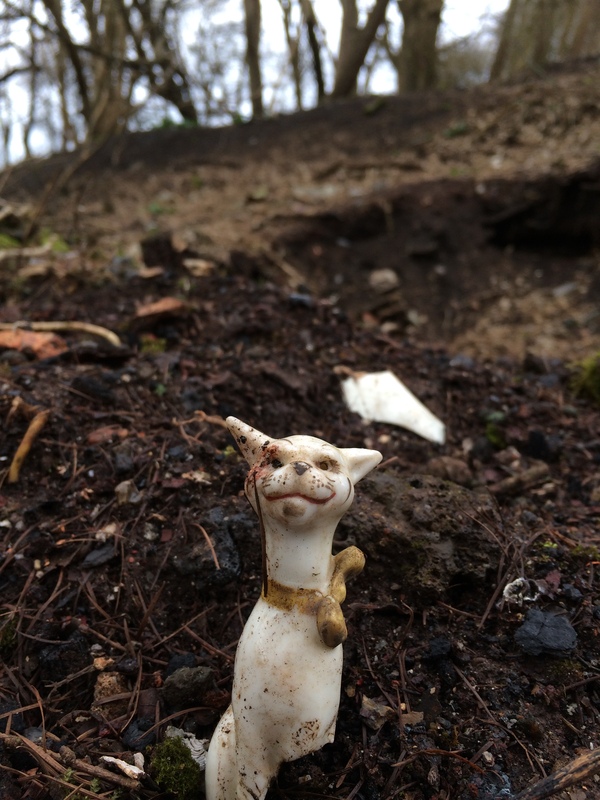 And there’s definitely something deluded about that grinning porcelain cat. My mission today is not to get the world and its problems in perspective, though. 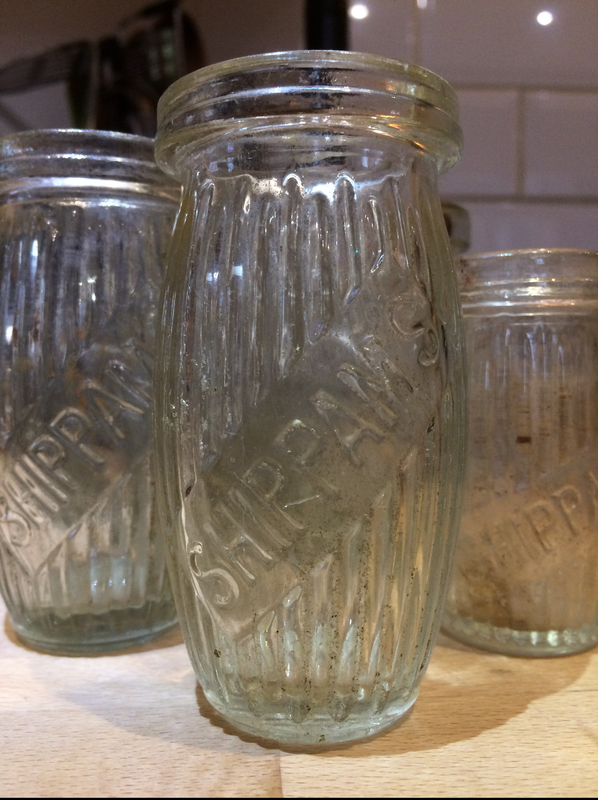 I’m simply here to collect as many old Shippam’s paste jars as I can, so we can use them as candle holders. It’s another craft experiment. Fad wouldn’t be too harsh. For one thing, I’ve never made candles before. For another, I’m not sure the necks will be wide enough. They’ll probably explode when the wick burns down. But it’s worth a go. There’s something pleasing about these little ribbed pots, with their embossed name across the middle like they’ve just won first prize in the paste pageant. I can imagine them in the middle of a table, scented with an essential oil. And it feels good to do some independent recycling, some re-purposing. I want to prove to them – and to me – that all the fuss of that production process in the fifties, from the fishing fleet to the glass factory, the packaging plant to the vans driving up and down the country – that great and energy consuming enterprise could lead to something more than just a limp sandwich on a soggy Saturday afternoon, and then seventy years in a dump. There must have been a lot of sandwiches, because these paste bottles are everywhere. It’s like a paste bottle plague, lying around in large numbers on the surface, along with bigger, more alluring bottles, Lung Tonic, Sanival, Califig, and look! The leg from an old bisque doll. I’ve gone prepared with a messenger bag and gardening gloves. (I’d thought about taking a trowel, too, but it would only have slowed me down.) As it is, I fill the bag in five minutes. Back home, the jars washed and drying by the side of the sink, I go online to look up the whole Shippam’s paste phenomenon. There’s archive footage of the factory in Chichester, shot in 1954. Hundreds of women in white coats and hats, folding boxes, filling jars with a nozzle, packing jars, putting boxes of jars onto a conveyor belt. The voiceover is typical of the time – glassy, patrician, describing the whole procedure over a jaunty soundtrack, as if what we’re witnessing isn’t simply the production of sandwich paste, but the maintenance of the British Empire, the production of the grouting needed for all the building work, the salmon-flavoured gack to keep us all in the pink. There are two chilling sequences. 1. Why did they bring in so many bones? If they’re serious about handing out wishbones to visitors, wouldn’t a small tray suffice? Or do they have that many visitors? 2. It wasn’t such good luck for the chicken. I don’t know what’s more unsettling. The thought of Mr Twobit packing tongue, or the thought of his daughter working there. Still, a happy by-product of two hundred years of industrial sandwich paste making in the south east is me, scrambling around on this dump in a pair of green gardening gloves and a messenger bag filled with dirty paste jars. I wonder what the commentator would say about that.